Why Cross Platform App Development? Imagine you are CEO of a chain of clothing stores. You serve customers of literally all genders, ages, shapes, and sizes. But how much business do you think one of your stores would get if it only sold one size in each piece of clothing? Not very much, right? Uh oh! Your profit margins aren’t looking good at all! So, what do you do? You open your doors to an array of sizes and styles! The only way to serve your customers fully is to be versatile! Today, versatility is everything. We know that for anything to succeed, it must be in high demand and come in a variety of materials, shapes, and/or sizes. So, it’s crazy to think that an app built for one platform can reach its true, full potential. Think about it. If you have an app built for Android, you will be missing out on all the users who have Apple IOS devices (and vice-versa). Cross platform app development is the smart way to go if you want your app to be fully and richly successful! To further that thought, let’s look at the pros and cons of cross platform app development. Using the cross platform method, developers create one code base. This means that you only have to build the app one time, using a universal code base. If you didn’t use the cross platform app development method, more time and money would be spent to complete the development cycle of the same app on different platforms. You will save on development costs and time by sticking with one, cross platform method. Like we said earlier, if you have a cross-platform app, you will reach many different users instead of just one group that uses one platform. You began the app development journey for a reason. Please don’t restrict your dream of helping others and building your business by offering your app to one platform’s users. Imagine all the users you will reach with the cross platform app development approach. Some development “tools” available on one platform may not be on another. A development tool is used to develop an app and can come in many forms (such as a programming language or an interface design). Think of it like this: Each platform as a toy chest. Each chest has a set of building blocks that are unique and only in that one chest/platform (like a different color, size, or shape). If you want to build a castle with those blocks, your castle will be much larger, interesting, and eye-catching if it uses a variety of blocks from each chest (platform). An app that uses cross platform development builds an app (the castle) with tools (the blocks) from a variety of platforms (the toy chests). When you build an app with only one platform, you can only use development tools that are specific for that platform. All user interfaces have issues. It’s just a fact of life that we must accept and work through. These issues usually come in the form of guidelines that are specific to one interface. For example, Apple is infamous for its strict guidelines. Having to accommodate these guidelines takes time. So, when building a cross-platform app, you will have to make sure that all coding adheres to the guidelines set out by each platform you are utilizing. When a new version of your smartphone’s software is released, what do you do? You download the new software, right? Once the software update is complete, you may notice some of your apps begin malfunctioning/freezing. This is because the app’s development team hasn’t released an update yet to accommodate the new software version. Your cross platform app development may take a little longer to update since it is built to be compatible with many different platforms instead of just one. This is especially true if 2 or more of the platforms issue system updates around the same time. Basically, in general, lags between software updates and app updates can be expected (unless you have a psychic on your development team!). All platform tools will have disadvantages that will need to be worked through. If you build an app for one platform only, you will be able to tackle these disadvantages quickly. But, if you build a cross-platform app, you will have to work on several different platform tool disadvantages. 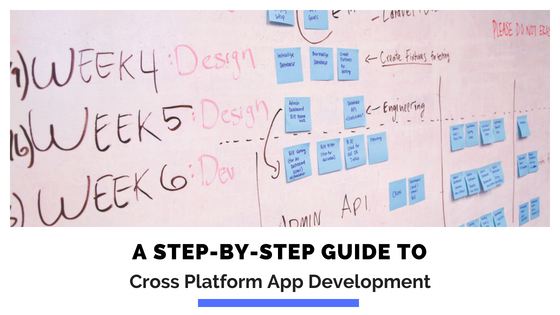 Now, if you aren’t on a tight deadline, go ahead and follow the cross platform app development method so you can work through each platform’s quirks early on. This will save you time later on. What’s my app development timeline? When you first begin your app development, you need to figure out when you want your app to launch on each platform. For example, if you want to release your app for the IOS platform in a month (tight deadline), then native app development (not cross-platform) will be a good choice for you. This is because Apple uses Swift as its programming language. Swift is easy to use and will take less time to develop an app with. Once your app is launched on the IOS platform, you will be able to begin work on your Android version, without being rushed. On the other hand, if you need to launch an Android app in a short timeframe, cross platform app development will be the best option. This is because Android’s default language for app development (Java) is more complex and may present you with more difficulties to handle. A cross-platform coding will help to eliminate some of those difficulties by building your app with a basic code. What’s my app development budget? Here’s the deal: Budget is a big part of app development. So, when you are trying to decide if you should do a platform-specific or cross platform app development, take time to consider the app development costs of both options. Talk with your app development team and come up with estimates for each platform being developed separately, and then a cross platform app development estimate. Typically, cross platform app development is cheaper, but that’s not always the case. Keep in mind that the costs will not only depend upon the platform but also all the components you decide to go with for the app. What will be my app’s feature set? If you have an app that will be the center of your business (like stemming a business from your app) or want complex features or animations, a native app (not cross-platform) is right for you. With a native app, you will be able to implement a fast integration of new features, monitor the app’s performance, and provide an enriched user experience. On the opposite hand, if you have a simple app that doesn’t have a lot of customization/features, then cross platform app development is the way to go. The basic coding will be able to accommodate simple features without issues. My digital strategy: Does cross platform app development fit in? If your current digital strategy and resources include a website that has many features, interactivity, and complex functions, then cross platform app development is not the best path for you. Developing your app to mirror the bells-and-whistles of your website will present many headaches. Think about it like this: Imagine you have a large, framed portrait in your home. The many precise details are what make the portrait unique and beautiful. Then, a family member asks you to take a picture of the portrait with your phone’s camera and send it to him for an art appraisal. Will the appraiser be able to see all the details from that one small photo on your phone? Absolutely not. The same thing is true for an app. If you try to fit all the things that make your website great into an app, going with a cross-platform’s basic coding won’t do the trick. You need to carefully develop the app on each platform so that your users won’t be disappointed by the loss of features and interactivity they once experienced on your website. Cross platform app development is best used for a business who hasn’t developed a website yet. If you are looking into developing your app with the cross platform method, we hope this article will give you some guidance and clarity on what exactly a cross platform app is. There are pros and cons to every situation and deciding whether to use a cross platform or native app development method is no different. The early stages of app development are when many important decisions are made. But, we want you to know: You don’t have to make these decisions alone! At Gomeeki, we develop both cross platform and native apps for a variety of clients. Like most development teams, we believe in versatility and the customization of apps to fit your ideas and needs. With years of experience to back us up, we stay up-to-date on the latest platform releases and update our clients’ apps accordingly. We work tirelessly to be sure your expectations are met, and you are more than satisfied with your decision to choose us as your app development team. We look forward to speaking with you! Next PostHow to Develop a Successful Mobile Banking App?